L-R: Manager, Upstream and Commercial Negotiation, Nigeria Agip Oil Company Limited, Pius-Milverton Ogunjiofor; Chairman/CEO, Geometric Power, Bart Nnaji; Managing Director/CEO, Gas Aggregation Company Nigeria Limited, Morgan Okwoche; General Manager, Gas Portfolio, The Shell Petroleum Development Company of Nigeria Limited (SPDC), Yemi Famori; and SPDC’s General Manager Business and Government Relations, Bashir Bello; at the signing of the Gas Supply and Aggregation Agreement for the Aba Integrated Power Project in Abuja… on Friday. The Shell Petroleum Development Company of Nigeria (SPDC) and its joint partners have signed a gas supply and aggregation agreement that will support the 140 Megawatts Aba Integrated Power Project in Abia State. The agreement, signed on Friday in Abuja, was between SPDC, Geometric Power Aba Limited (GPAL); and Gas Aggregation Company of Nigeria (GACN). The Minister, who was represented by his Special Adviser on Fiscal Strategy, Dr. Tim Okon, said the government was determined to ensure commercial sustainability of any such project with the potential to grow the gas market. Chief Executive Officer of GAPL, Prof. Bath Nnaji, said the project was structured to incentivise gas suppliers to invest in gas production for the domestic market. 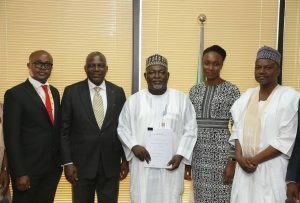 The General Manager Petroleum Engineering of the Nigeria National Petroleum Corporation, Muazu Awaisu, who represented the Group Managing Director of NNPC; and the General Manager Gas Portfolio of SPDC, Yemi Famori, witnessed the occasion.